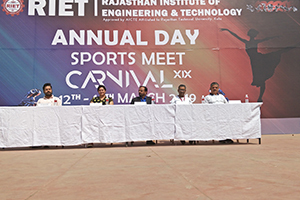 After the inauguration of the national level mega event – Carnival XIX, which was graced by Principal RIET Dr. Saroj Hiranwal , Dean of Academics Professor Kapil Dev Sharma Vice Principal RIET Dr Sachin Sharma, T&P Advisor Prof D D Johri, Event coordinator Ms Jyoti Khandelwal along with Chief Guest Shri Sanjay Yadav, (IES) Executive Director (Electrical) Jaipur Metro Rail Corporation Ltd, the hours proceeded with the continuation of technical, literary, creative, cultural and fun events the entire day of 14.3.19. In sketching the talents of the young artists was seen. Lovely sketches were made by all the participants. Each was good than the other. The youth parliament was a massive success. 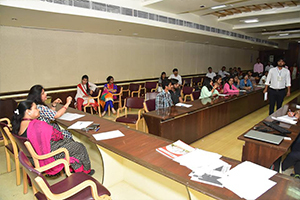 Students and faculty members enjoyed a lot and it looked almost like a real parliament. PUBG, IOT CHALLENGE, FIFA were the competitions which were attempted by the young technocrats. Antakshari was too good and very interesting. Singers put up their best talents in this event. The songs appeared like a bouquet of flowers being presented before the judges. Events like JAM BEE attracted a lot of enthusiasts, who wanted to show their talents in language. Mehefil E Alfaz saw the involvement of budding young poets who put forth their talents in poems and sonnets. The evening was the most awaited hour as various events were eagerly looked forward to. The dance performances encouraged people to shake their legs with their colleagues. The atmosphere definitely was awesome and the entire audience tapped their legs and cheered for all the dancers. Who is a Choreographer & Actor, he is Director of Unbeatable Group Founder of DJD (Dance Jaipur Dance) he is International winner in western dance in 1997. Worked with Saroj Khan, Shakti Mohan, Mudassar Khan as Judge in DJD. Worked with comedian VIP as entertainer in comedy show Glamour comedy night with VIP. Mr Vikas. Judged Miss Jaipur pinkcity 2017 with Aditi Govitrikar. Judged more than 200+ shows, events, Choreographed 500+ events, songs, fashion shows. Mr vikas highly praised all the performers and also gave them tips on improving their performances. The most eye catching event was the Ramp walk in which the winners were “the show stoppers” the group from RIET. The runners up were the group from JECRC College and the winners were RIET Team. The chief guest on this occasion was Miss India wheelchair, Ankita Sharma who has many laurels to her credit. Ms Ankita though specially-abled is a Management Postgraduate and works for Belgium Diamonds New York. She was accompanied by Miss Priyanka sharma who is a fashion blogger. 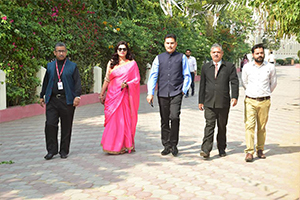 The excitement of the event Ramp Walk electrified the air. Variety is the spice of life. Is adds to the joy & excitement of mankind. Fashion offers a great variety in the field of human dress. Fashion may be defined as way of living, dressing, decorating etc. which are popular today. The limelight all events was this event of ramp walk. Winners of Ramp walk were RIET show stoppers and runner up were JECRC team. 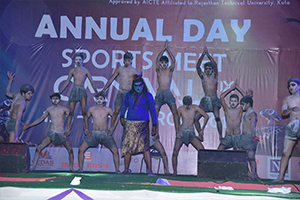 Dance competition in various categories (single, duet and group). These were also held in the evening. The whole event was a massive crowd puller. 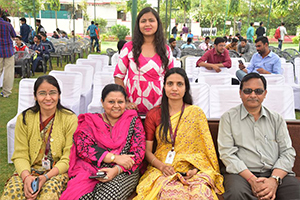 All the students along with faculty members enjoyed a lot. 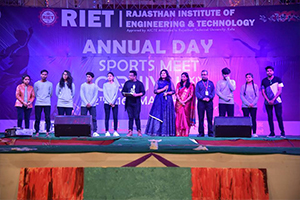 Speaking on the occasion Principal RIET Dr. Saroj Hiranwal said that the performances given by the students are superb; this is the result of their untiring efforts. The day ended with a happy note. The excitement of the earlier evening of carnival “Day one” had barely faded when the new morning with a new spirit arrived. It was the second day of the two day, “Carnival 2019”. The enthusiastic mass was waiting impatiently for the activities of the second day to resume. 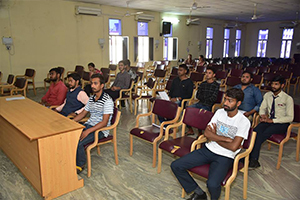 In Siyahi, students tested the strength of the ink of their pen and neurons of brain in the realm of events related to literature and knowledge. There were GD, along with MANAGEMENT QUIZ, & KALPANA. The events proved to be an all-in-one diet for everyone however remotely concerned with the flavor of words language and literary bent of mind. Calming the restless nerve of tech geeks was Technothon– the technical events. There were fascinating activities of nuts and bolts, HAKINA, JUNK YARD & PRESSOWARE etc. Plus the classroom war of video games, which were given a larger platform where enthusiasts challenged their friends and emerged as the champion of respective competitions. In Spectra, the series of cultural events brought euphoria to the mass. The ABHINAYA, HARMONY AND WHIPLASH encouraged the audience to sway in merriment with their colleagues. The drama left everyone with a beautiful message to think over. For testing the energy flowing in the veins of youth a stack of sports and fun events comprising of highly entertaining activities and games. The idea of every student being an artist was promoted and thus a canvas of activities was provided where they could paint and sketch a masterpiece. Expression-devotees were drawn towards poetry (kavya) and story writing (kalpana) saw the ingenious ones working hard in similar such literary events in Siyahi. GD held a great attraction in which many good orators spoke on various topics. 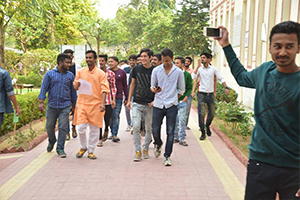 Students from other colleges also participated in all these events. Another attraction was Talash (mock CID) which was a great crowd puller. Students rushed to participate in this event also. In the event Abhinay beautiful dramas were staged. Great direction, wonderful acting and stage performance enthralled the audience. Some were tragedies while some comedies. On the whole the event was awesome. Drama one of the most popular events is the way to make aware the people about the real facts by acting different roles in different stories. Silent DJ is the task event which was conducted under the category called “SPECTRA” In this event participant use to dance on music with probe and theme. This also a team game in which each team member has to participate in different rounds. Some prizes were also distributed on this occasion. 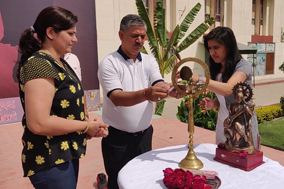 Principal RIET Dr. Saroj Hiranwal, Dean Academics Prof Kapil Dev sharma, Vice principal Dr Sachin sharma, T&P Advisor Prof D D Johri gave away the prizes to the winners of various contests. The singing contest brought together many budding singers. Lovely voices floated through the lush green fields of RIET. Competition was in the air. Each singer was excellent. Last but not the least on this evening came the event whiplash- the battle of bands. It was a performance “Par Excellence”. The troupes played beautifully and the audience was fascinated. 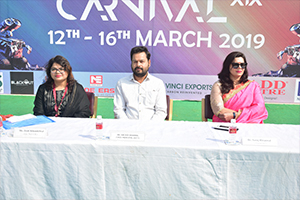 On all the above said events the judges were invited from various other prestigious organizations, who gave in their valuable time to judge the contestants and be a part of the carnival 2019 in RIET. The judges were from Osiris which has been a commercial band since 2012, headlined in a number of colleges across India. Ashish Mahajan. Vocalist and Multi instrumentalist he is the founder of the School of Rock institute and he has been teaching in Jaipur since 2011. ROHAN VATVANI expert on the drum, 3 times intercollege drum solo winner. RAHUL KRISHNANI, guitarist Funk and blues composer and released songs in personal projects. VARUN GUPTA, bass guitarist, one of the best bass guitarists in Jaipur. 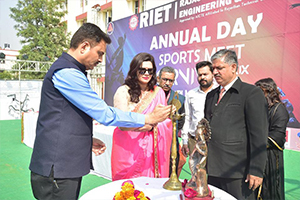 Speaking on the occasion Principal RIET Dr. Saroj Hiranwal highly appreciated the performance of the students and said that the events have certainly brought out many talents and enthusiasts from among the RIET scholars, Dean Academics Professor Kapil Dev Sharma said that the performance and the work done by the students is exemplary. This will definitely encourage the juniors and other students to participate and show their hidden talents. 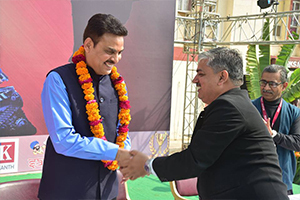 Vice Principal Dr Sachin Sharma congratulated all the students and winners and encouraged everyone to put in their whole hearted participation in such events. A few students also commented that events like this are very enjoyable and also teach the value of participation and leadership skills. Everyone said they look forward to many such events in the college. 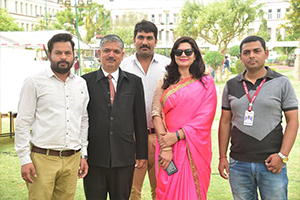 The evening ended with a happy note with the anticipation of the Annual day which is to take place next day i.e 16.03.19. 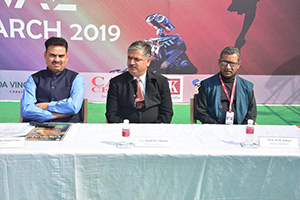 Following is the list of all the winners and runners up of the various events of the carnival 2019.